One recent local environmental cause, especially popular in California, has been to ban or tax plastic grocery bags. The expressed hope is that shoppers will instead carry reusable grocery bags back and forth to the grocery store, and that plastic bags will be less likely to end up in landfills, or blowing across hillsides, or floating in water. The problem is that almost no one ever washes their reusable grocery bags. Reusuable grocery bags often carry raw meat, unseparated from other foods, and are often stored for convenience in the trunk of cars that sit outside in the sun. In short, reusuable grocery bags can be a friendly breeding environment for E. coli bacteria, which can cause severe illness and even death. Jonathan Klick and Joshua D. Wright tell this story in "Grocery Bag Bans and Foodborne Illness," published as a research paper by the Institute for Law and Economics at the University of Pennsylvania Law School. As their primary example, they look at E. coli infections in the San Francisco County after it adopted an ordinance severely limiting the use of plastic bags by grocery stores. 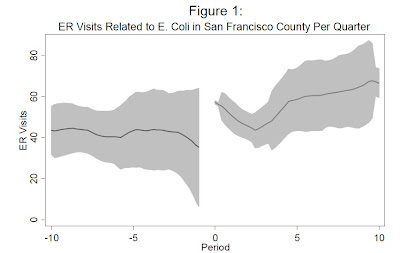 As one piece of evidence, here's a figure showing the number of emergency room visits in San Francisco County related to E. coli for the 10 quarters before and after the enactment of the ordinance, where zero on the horizontal axis is the date the ordinance went into effect. (The shaded area around the line is a 95% statistical confidence interval.) Clearly, there is a discontinuous jump in the number of emergency room visits. 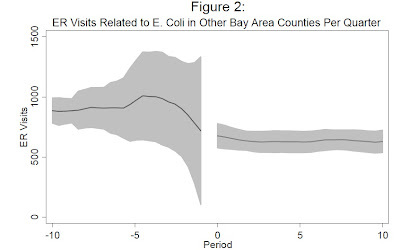 For comparison, here's the same measure of emergency room visits related to E. coli infections for the other counties in the San Francisco Bay Area in the 10 quarters before and after the ordinance was enacted. These counties don't see a jump. 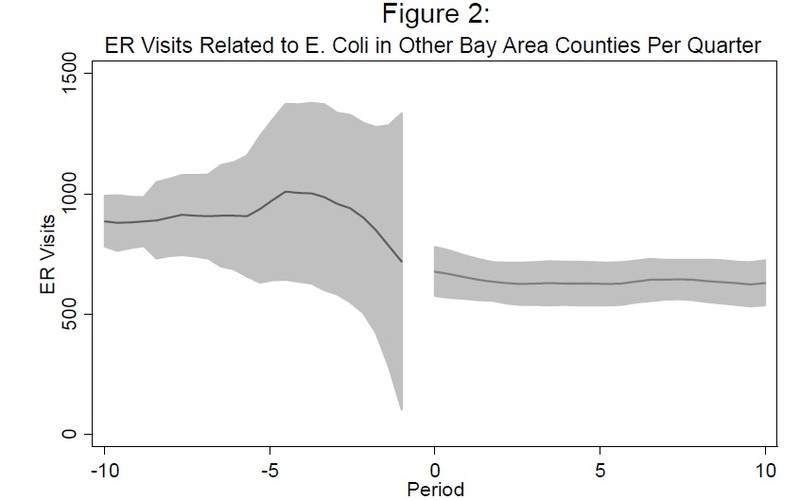 Overall, they find that San Francisco typically experiences about 12 deaths per year from intestinal infections, and that the restrictions on plastic bags probably let to another 5-6 deaths per year in that city--plus, of course, the personal and social costs of some dozens of additional hospitalizations. With these costs taken into account, restrictions on plastic bags stop looking like a good idea. Of course, a possible response to this problem is to launch a public information campaign to encourage people to wash their reusable grocery bags. But that response then leads to two other issues. First, if public information campaigns can be effective on the grocery bag issue, the campaign could simply focus on the need to dispose of plastic bags properly and recycle them where possible--without a need to ban them. The argument for an ordinance sharply limiting the use of plastic grocery bags is, in effect, based on an implicit assumption that public information campaigns about grocery bags don't work well. Second, if reusable grocery bags are washed after each use, then any cost-benefit analysis of their use would have to take into account the costs of water and detergent use. I have no idea if these costs alone would outweigh the benefits of reusable grocery bags, but it might be a near thing. Like most economists, I have a mental file drawer of "good intentions aren't enough" stories. The push to ban plastic grocery bags is one more example. Added February 14, 2013: For a short memo challenging the findings of this study from the San Francisco Department of Public Health, see here.